The small size and fast thane makes the Stella 69s great for acceleration. The quare lips are equally comfortable gripping or drifting the same corner. Stella 69s are at home on the race course as well as slashing the streets. Boards used: Drop Through, Blockhead / Lowrider, Bamboo Kicktail, Kicktail, Beer Runner, 38" Kicktail, Bluntnose, 42" Pintail, and Pintail. © Stella Longboards 2016. 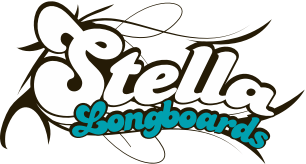 Stella longboards is a SDS Skateboards brand.